Review: Girls of the Hamlet Club, by Elsie J. Oxenham | So This is School! First published in 1914, Girls of the Hamlet Club has never been easy for collectors to find, with the result that many Elsie J. Oxenham fans, including myself, have never owned a copy until the book was recently republished by the Elsie J. Oxenham Society. This thick, sturdy paperback is beautifully produced, from the glorious coloured illustrations, each with its own plate, down to the choice of font, which is clear and easy to read but with a distinctly old fashioned feel, which brings a pleasurable period feel to the experience of reading the book. The book’s heroine is Cicely Hobart, a lively, confident, fourteen-year-old, who starts the Hamlet Club as a way of rebelling against the unpleasant snobbery of her new school in Wycombe. The girls soon discover the charms of folk dancing as a means of entertaining themselves and they practise diligently and devise a folk themed entertainment for Cicely’s grandparents. Their real challenge, however, comes when the rich town girls find themselves in an impossible situation and the Hamlet Club must decide how much they really want to heal the huge divide in the school. Any book worth reading covers many different themes, and Girls of the Hamlet Club is no exception. Snobbery is, of course, a major topic, as are tolerance, forgiveness and self sacrifice. But for me the over-arching theme, which includes and surpasses all of these, is that of choices. By the time the first hundred pages are over, Cicely has had to make two significant, life-changing choices: The first is, of course, to stay at Whiteleafe so that she can be near her grandparents, and it’s not an easy decision for her to make, for they have not treated her now-dead mother well and Cicely feels no loyalty towards them. The second is made when, on her first day at her new school, she determines to support and defend Dorothy Darley, who is thought by most of the school to be a cheat, although Dorothy herself denies the charge. Shortly afterwards, and perhaps most momentously, she declines the offer of the leaders of the school to become a member of their clubs because of their resolve to exclude the poorer members of the school from their society, simply because of their lack of money. Other choices abound throughout the book. Before Cicely makes her own first decision, we hear the story of Margia Lane’s self-sacrifice. Subsequently, each member of the Hamlet Club has to make the choice that she will abide by the rule ‘to be friendly to everybody – everybody’, which of course includes the rich ‘Townies’. Then comes Cicely’s decision to keep her own affluent background quiet, and later one of the Townies, Madeline, has to decide whether to try to befriend the Hamlets or not. Then, finally, comes the greatest choice of all: most of the cast of the school play succumb to measles and the Hamlet Club, knowing that they could easily provide an evening’s entertainment to replace the play, must decide whether to give up their precious secret for the sake of the school. Elsie Oxenham was at the peak of her powers at the time of writing Girls of the Hamlet Club, and her plotting and characterisation are excellent. Cicely is a delightful character – just bossy and noble enough to be less than perfect, but still lively, charming and kind. The secondary characters are equally appealing, particularly Miriam, Marguerite and Georgie. Dorothy Darley, while falsely accused, is no drooping damsel but rebellious and selfish, admitting herself that she can be nasty on occasion. On the other side, Hilary Carter, the imposing leader of the Townies, is actually rather a pleasant girl if one overlooks her prejudice against the scholarship girls, and she certainly eats her words quite graciously at the end of the book. There’s not a single character who is too good to be true, nor one who is too bad. 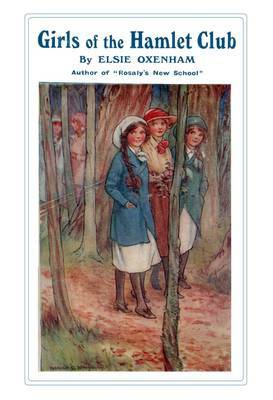 There is never a dull moment in Girls of the Hamlet Club – the chapters are short and the story fast moving, but Elsie Oxenham takes time to pause and savour the beauty of an October morning, or a warm scene beside a fire in the winter, and her descriptions of folk dancing, both hidden away in Darley’s Barn and the more elaborate entertainment devised for Cicely’s grandparents and the school, are enchanting. It’s a real gem in the Girls’ Own genre and I, for one, am grateful to the Elsie J. Oxenham Society for reprinting it so that fans can enjoy the book once more. This is probably really sad, but I love the fact that she talks about John Hampden and ship money and assumes that her readers will know exactly what she’s talking about, which presumably most of them would have done or else she’d have explained it. I long to love in a world where you can talk about important historical events and know that people will know exactly what you mean :-). I was so pleased to read the origin of the “Queen” tradition. I find some of those long processions and ceremonies (and the gowns! and the names!) in the later books pretty dire; but in this first book it’s all charm and originality. I was so pleased to read about the origin of the ”Queen” tradition. I often find those long processions and ceremonies (and the gowns! and the names!) in the later books pretty dire. But in this first book it’s all charm and originality.